Bono will make an appearance at Fordham University with band U2, sources say. 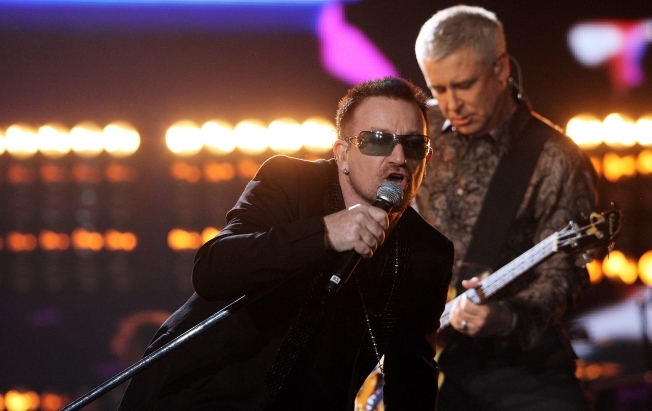 Bono and Co. could be soon be rocking out in the Bronx. U2 is set to perform on the Fordham University campus March 6 to film a stint on ABC program "Good Morning America," the Hartford Courantreported. The "secret" gig is part of U2's whirlwind week in the Big Apple to promote their new album, "No Line on the Horizon." The event is reportedly open to Fordham students and staff only and will require a university ID for access. Fordham professors have been told to cancel their classes that morning "for security reasons," the Courant reported. Word of the "Joshua Tree" band's visit to the university had students and faculty alike buzzing. "I'm absolutely shocked," Fordham senior Lauren Cerulli, 21, told the New York Daily News. "I'm a huge U2 fan, and I've wanted to see them in concert for five or six years," she said. ABC and the university refused to officially confirm the concert's location.